In the mid-50s, there was some major changes going on in the publishing industry: readership for pulps and magazines were declining, and it was rising for novels. Authors had an interesting way to respond to this: take a couple of existing stories, rewrite bits and package them as a novel. A.E. van Vogt actually coined a term for this: We call it a 'fix-up' novel, and a number of authors throughout the 50s (and to a lesser extent, to the present day) engaged in this practice as dedicated novel chains were founded. (More on that soon). van Vogt is an interesting case here. I remember reading a bunch of his stories when I was in high school, and revisited Voyage of the Space Beagle a couple of years ago. It wasn't really my thing, but it was entertaining and fairly TV-like in structure. Go read A.E. van Vogt and the Fix-Up novel over on Kirkus Reviews. Science Fiction Writers, Second Edition, edited by Richard Bleiler. This volume provides a decent biographical sketch of the van Vogt. Men of Tomorrow: Geeks, Gangsters and the Birth of the Comic Book, by Gerald Jones: This book provided a couple of key details on the nature of the early magazine culture. It's a Fix-Up, David Langford: This essay by Langford provided a really neat nugget: van Vogt was the one who coined the term 'Fix-Up', and pointed me to the connection between the novel and the film Alien. Survey of Science Fiction Literature, vol 5, edited by Frank Magill. There's a good critical review of Voyage of the Space Beagle in this volume. Seekers of Tomorrow: Masters of Modern Science Fiction, Sam Moskowitz. Moskowitz's book is to be handled carefully, but the entry on Van Vogt provides some good information on his earlier works and introduction to the science fiction world. Brave New Worlds: The Oxford Dictionary of Science Fiction, edited by Jeff Prucher. This provided the definition for the 'fix-up' novel. The History of Science Fiction, by Adam Roberts: van Vogt gets a brief mention in Robert's book, but it provides a good look into his critical reception. 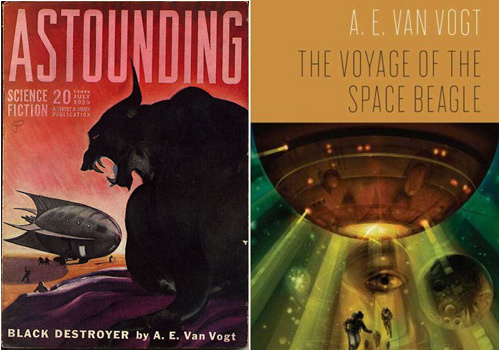 A Requiem for Astounding, Alva Rogers: This book is a good look at van Vogt's story placement in Astounding - 3/4s of the stories in VOTSB were first published there.